VIDA blog Managing Editor Alana Piper explores popular conceptions of book thieves and compares these to actual instances of book theft in late-nineteenth-century Melbourne. 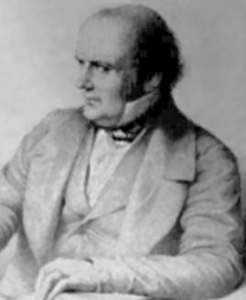 Mathematician and book thief Guglielmo Libri Carucci dalla Sommaja (1803-1869). Image via Wikimedia Commons. In October 1894 retired Presbyterian minister and classical scholar George Graham committed suicide while under suspicion of theft. The elderly Graham had been accused of stealing a number of expensive works from Cole’s Book Arcade in Melbourne. The then world-famous book emporium – reputedly the largest on the globe with approximately two million books in stock – suffered regularly from such losses. However, the systematic depredations made in the classical department had been noted over a period of eighteen months, and special surveillance was established that identified Graham as the perpetrator. Details of the theft, including both Graham’s name and his street address in Richmond, were quickly splashed across the newspapers. The story even went interstate, with one Tasmanian reporter commenting upon the ‘unenviable position’ his wife and daughter found themselves in. Unable to face the humiliation of being branded a common thief, Graham cut himself with a razor blade the morning he was due to appear at the City Court, dying of his injuries a few days later. In actuality, the book thief, or ‘biblioklept’, was seldom seen as a common criminal, but was regarded as a growing problem during the nineteenth and early twentieth centuries. Scholarly men like Graham were portrayed as the typical culprits of such thefts. Courage, resource and the philosophic mind, these qualities every successful burglar must possess, but the virtue in particular which singles him out for notice here, and which has not yet received due attention, is that which serves most reliably to distinguish him from the honest citizen. The burglar never steals books. The biblioklept was set apart from the ordinary thief not only by innate respectability, but by their motivation – a craving for reading material itself. The book thief discourse was thus shaped by prevailing expectations of who readers were. Men were believed to form the vast majority of book thieves. Book stealing was even described as a male strain of kleptomania, a condition normally said to effect women. The proposition that male kleptomaniacs focused on books while female shoplifters were attracted by the ‘odd bit of fine lace’ contrasted female superficiality to men’s intellectual attainments. Likewise, the true biblioklept was discussed as belonging almost exclusively to the educated classes. Cases matching this stereotype certainly appeared before Melbourne courts. Fifteen months prior to George Graham’s arrest, another well-publicised theft from Cole’s Book Arcade involved an Oxford graduate employed as a private tutor, who had also stolen a number of books from the University of Melbourne library. Eight months after this a schoolboy ‘of respectable connections’ was discharged from the police court with a warning after stealing a volume of Euclid from the store. Newspapers wrote indulgently of the boy’s ‘exceptionally intelligent’ appearance and laudable desire to compare the book against the translation he was learning from at home. Courtroom sketch of young boy who stole Euclid from Cole’s Book Arcade. 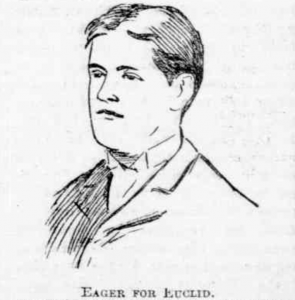 Weekly Times, 21 April 1894, 15. Across the same period as the cases cited above, however, Cole’s also experienced thefts by a bricklayer and a sailor. These individuals failed to arouse the interest or sympathy shown towards the ‘respectable’ book thief. Rather than an ‘irresistible impulse’, the common excuse proffered by working-class individuals for book stealing was drunkenness. It often remains unclear whether the thefts committed under this liquid freeing of inhibitions were inspired by financial motivations, or desire for the books themselves. The masses were not the only ones to indulge in book theft in a drunken freak. Nineteenth-century Melbourne Gaol Superintendent John Castieau recorded in his diary that he got drunk one night and stole a book from a brothel, where it had been used to prop open a window. This episode both challenges and crystallizes contemporary notions of who was a reader, and, by extension, a potential book thief. The book was found in a haunt of the underclasses, but the purpose to which it was being put suggested it was not appreciated so much for its literary merit as its physical usefulness. At the same time, its presence there at all is suggestive; especially considering the house belonged not just to criminals, but criminal women. The construction of the book thief as a classed and gendered problem largely reflected older understandings of who readers were that were not in keeping with the democratisation of literary culture wrought by the introduction of free, compulsory schooling in Victoria in 1872 and the growing availability to the masses of cheap, printed material. Yet views were slow to change, including among the judiciary. 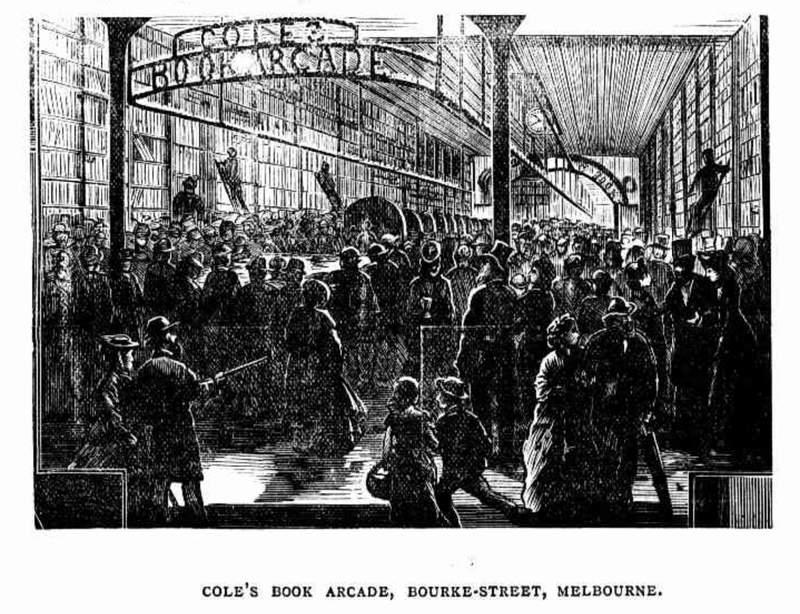 In 1898 Magistrate Joseph Panton caused a furore when he declared that Cole’s Book Arcade created more thieves than any other institution in Melbourne by throwing temptation in the way of people who were ‘not really thieves’. The remarks were made during yet another hearing before the City Court about a theft from the store, this time involving a woman, dressmaker Julia Neil. Panton criticised the store’s modern practice of simply letting people ‘wander about’ the numerous book-filled aisles, rather than keeping the stock behind counters where it would have to be shown to customers by staff. Illustration of interior of Cole’s Book Arcade. Frearson’s Monthly Illustrated Adelaide News, 1 March 1881, 43. Panton had also remarked that the shop did not do enough to discourage theft by vigorously pursuing the cases that were brought before him. The manager of Cole’s countered this offensive by pointing out that a private detective operated on the premises at all times. Despite such precautions, it seems that thieves apprehended at the store were not always prosecuted. In a letter to his wife in 1881, for instance, Cole described not just letting a thief go but giving him a shilling as it seemed to be a case of ‘real distress’. Apart from such philanthropic motivations for excusing thieves, many stores in this era were reluctant to push prosecutions where they risked attracting negative publicity. In this way, Panton’s remarks may have had an opposite effect from that he intended, with an article published in 1904 observing that the notoriety brought to Cole’s by the magisterial remarks had since made them even more reluctant to prosecute cases. Rather than resting with the responses published by the firm, the issue of whether the ready availability of books turned honest citizens into thieves was raised again less than a fortnight after the Neil hearing when another woman, Ellen Smith, pled guilty to stealing from the store. Not only did Panton use the opportunity to justify his original remarks, but Smith’s defence counsel actually urged that the store should be considered partly responsible for leaving the books without supervision. The case was remanded to allow the bench to consider the appropriate sentence. When the hearing resumed several days later, Cole’s interest in the matter was represented by prominent barrister Dr T. P. McInerney, who attempted to have Panton qualify or retract his comments. Panton, however, proved obstinate, citing a recent case in which two boys had stolen books from Cole’s as proof the store ‘made thieves’. He delivered a diatribe against people who expected the courts to protect their property when they did not take the trouble to do so themselves, then rather contradictorily stated that customers’ awareness that they were under surveillance by the store detective had a ‘demoralising effect’. He concluded by caustically commenting that Cole should be pleased he had received a great deal of free advertising from the affair, and fined the defendant Smith five pounds in default of a week’s imprisonment. Ignored throughout the second hearing was the fact that Smith was not a true ‘book thief’ in the popular sense of the term. She had stolen the books not out of literary desire, but to sell for profit. A number of those accused of book theft in this period were in fact ‘old offenders’ with previous convictions for theft, whose crimes were discovered when they tried to sell the books to second-hand dealers. On the other hand, this did not necessarily mean that those same thieves were not also readers, consuming the material before selling it on. In 1876, just a few years after Cole opened his Bourke Street store, a mother and two daughters were prosecuted for shoplifting a large quantity of merchandise from numerous Melbourne stores, including Cole’s. When the police raided their house, among the goods still on the premises was an appropriately chosen copy of Female Life in Prison, which one of the girls was discovered in the act of reading. At the turn of the twentieth century commentators sought to explain the aberrant figure of the book thief in terms of the changes modernity had wrought in the culture of consumption. However, they ignored significant shifts taking place in reading culture itself that challenged the conception of book-lovers – and therefore potential book thieves – as strictly middle-class males with erudite European reading tastes. 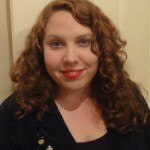 Alana Piper is a Postdoctoral Research Fellow at Griffith University, Brisbane. 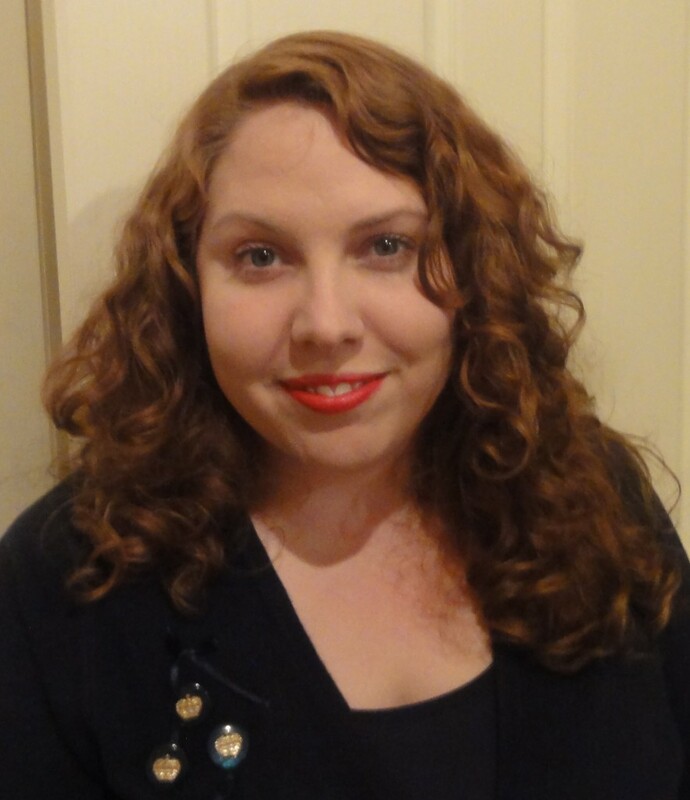 Her fellowship on legal and social identities of thieves in nineteenth- and twentieth-century Australia is part of the ARC-Laureate Fellowship project, The Prosecution Project. The full-length version of her article on book thieves can be found in Cultural and Social History.